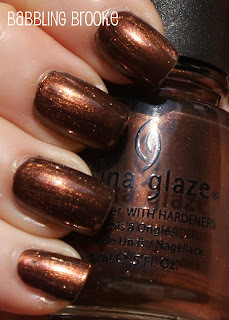 I am falling more and more in love with China Glaze's new Vintage Vixen collection with every polish I try. These next four are some of my favorites in the collection, which will be available early July 2010. For pictures of Ingrid, Classic Camel, Riveter Rouge, & Hey Doll, check out part 1 of the Vintage Vixen collection HERE. Check out part 2 of the Vintage Vixen collection and let me know which ones you love! Jitterbug is a stunning, shimmery gunmetal silver/grey. I really, really love this one and I don't have anything else like it. I wore this two weeks ago and was so excited about it, but today I was able to wear it on a super-sunny day and I am blown away but how much it shines in the sun. It is loaded with silver shimmer (very fine - no chunky glitters here). Jitterbug covered well with two coats and dried very fast, like most China Glaze polishes. I plan on wearing this one a lot this summer - it is a great hot weather shade. I need to find my Konad stamper and scraper because I really want to try Konading with this! Jitterbug is an awesome shade and one of my favorites from the collection. My first picture was taken in full sun, the second in the shade (both without flash). Swing Baby really surprised me. It just looked like an average gold in the bottle, but in real life it is a shimmery platinum with gold undertones. It is actually the exact same color as these adorable floral flats I picked up at Target over the weekend (even though my camera somehow distorted it to look darker). I'm wearing Swing Baby tomorrow when I wear my new shoes!! Swing Baby is slightly lighter and less gold than it appears in these pictures. I took more than 25 pictures of this color and still couldn't get it to capture right. It is a very beautiful polish and I really love it. I wasn't expecting to be this excited about this one. Swing Baby took three coats for full coverage, but it still dried quickly. In my opinion, Swing Baby is another excellent summer color. Like Swing Baby and Jitterbug, I can see Goin' My Way as a summer color - but Goin' My Way will also be a really excellent shade come fall. Goin' My Way is a rich coppery chocolate that looks totally duochromatic in the bottle. Goin' My Way is loaded with shimmer and glitter and reflects really nicely in the sun. It is slightly brushstroke-y, which is something I never mind in a polish. This one, like Swing Baby, really surprised me. I wasn't excited about this one in the bottle at all, but I really love it on my nails. I can see this being a great going to the beach polish. It covered pretty well with just one coat, surprisingly, but I used two for full coverage. Isn't Foxy a cute name? I'm pretty positive I had a stuffed animal fox as a child named Foxy. And being a darker, kinda vampy red, "Foxy" is a pretty accurate name for this shade. Foxy is a slightly burnt orange/coppery red. It has a lot of shimmer, like the others, and covered nicely with two coats. Foxy isn't my kind of color, but there is no denying it is a beautiful shimmer - and it seems rather original, in my opinion. Which China Glaze Vintage Vixen polishes are your favorites? Have you had a chance to see any of these in person? Thanks for checking out the new colors! OMG, I can't even pick a favorite! I love Jitterbug because it is such a gorgeous, shimmery gunmetally color, and I am to incredibly drawn to those types of shades. But Swing Baby is so pretty, so lush, so luxe... I really want to wear it! And then Goin' My Way is such a gorgeous coppery chocolatey ... wow. So pretty... But but but FOXY!!! Deep shimmery coppery red that has my name all over it!!! I haven't seen any of these personally(and it take much to see), but I found all these gorgeous. My favorite was the swing baby! It looks perfect! I know I'll get them all!!! But I feel that Jitterbug and Ingrid will be my two favs. I will so be stalking Sallys for these next month!!! oh i have 5 colors from this collection that ima die if i dont get and jitterbug and swing baby are two of them. I must have the awesome glowing glittery awesomeness! and i love the colors, i might get some soon. Those are interesting colors. I'm not much for golds/bronzes, but I love Foxy! This is such a gorgeous collection and your pictures are wonderful ! Jitterbug is absolutely beautiful! I can't wait to get that one! Thanks for the swatches! These are gorgeous - the colours remind me of fall - I guess if they are coming out in July they are meant to be fall it's just so funny the way fall collections come out in the summer! you have a very very nice collection of lacquer ! I'm very impressed !